Warning to all couch potatoes, you will find this extremely stressful! London’s Air Ambulance pilot, Captain Neil Jeffers, and doctor, Dr. Tom Konig, are soon to complete the ultimate endurance test, seeing them run 8 marathons in 6 days through the deserts of Jordan, in a bid to raise money for the charity. 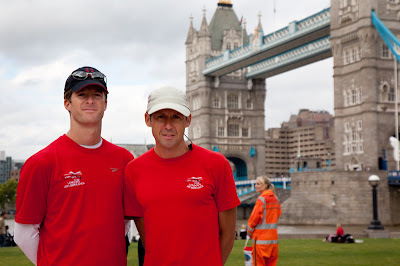 On 3rd September 2011 the London’s Air Ambulance duo will be running 200 miles (360 km) through Wadi Rum, a protected area covering 720 square kilometres of dramatic desert wilderness in the south of Jordan, and will finish at Petra. Thanks to London's Air Ambulance service you will be rescued without having to show an insurance card or a bank card. Their medical expertise at the scene of an accident may be critical in saving your life. This is a charity. On their days off they run 8 marathons in the dessert to fund saving you're life! Londoners and anyone who has ever visited or intends to visit London find a few £'s to support these guys. That is a lot of running. Very impressive. Good luck to Neil and Tom. Wow, well done to them Mo, I'm doing a 14klm walk/run in a few weeks and that's extreme enough for me!! What a dedicated duo! Bravo! wow, amazing! great job guys! That is some run they are going on, and it is for such a worthy and good cause, that truly saves lifes. I love walking but have never been good at running. I am most impressed by the pair's planned performance and also by the services provided by the charity they support. What a remarkable project! I wish them all the best. wow , very impressive !!! Too much running it is! that is tiring.